John Rios, Immortalized on You Tube! We recently learned about a video on You Tube that is just amazing. This is an original song and video written and produced by someone in the UK who is a big fan of John Rios’ artwork. All of us here at Sew What? and Rent What? are big fans of John’s, and so proud that he has joined our team, and we know that there are a lot of other fans out there. But this song and video are really special. Check it out – it is funny, catchy, and a true celebration of John and his incredible talent. I can’t believe that Thanksgiving is here again. 2011 seems to have just flown by, and soon it will be Hanukkah and Christmas and Kwanzaa. Not to mention New Years Eve and then the start of 2012. It is hard to believe, but we have published over 300 posts and in just a few months (March 2012), we will celebrate the third anniversary of this blog. It is exciting to see the blog grow. This year I welcomed two new blog contributors – John Rios of Sew What? and Marianne Lopez of Rent What? It is great to have the new perspective and wealth of knowledge that each of them contributes to this blog. Thanks for joining me in the blogosphere, John and Marianne! But without you, the readers of this blog, all of it would be in vain. In that spirit, I would like to thank you, the readers, for your support. Hope you are all enjoying a wonderful Thanksgiving! We’ve recently heard the devastating news that a roadie who has been on countless tours over the years with such bands as The Police is having a health crisis that we thought we’d bring some needed attention to. Dokie (Brian Milne) began having health issues a few months ago. These issues came to a head while he was touring with Lenny Kravitz in France in mid October. He was taken to a local hospital, where he learned of major damage to his kidney, and the doctor recommended removal of the kidney upon Dokie’s return to the United States. Shortly thereafter, Dokie arrived in the United States, where he saw a doctor in San Francisco who diagnosed a cancerous tumor. The doctor scheduled surgery for early November, but a pre-op CAT Scan revealed the cancer had spread to his lungs, liver, and possibly brain. As a result, surgery was cancelled. A biopsy was then done on the liver, which revealed the cancer is indeed in his liver, lungs, and bones. Dokie’s health is diminishing rapidly, but he is not giving up and neither are his family and friends. At this point chemotherapy is such a long shot that Dokie and his loved ones see their only hope in other methods of treatment. However, the cost for such treatment is estimated at about $50,000. Dokie has an amazing girlfriend, Jessica Barsotti, who has been is one of the key persons in making sure Dokie is cared for. As an attorney, Jessica is coordinating donation efforts. She has a PayPal account available for those who wish to donate online. It saddens us to report on such a tragic event, but we know how many people have been touched over the years by Dokie, and so we thought it important to spread the news. Please forward this onto anyone you think of that can help. If you can’t afford to donate money, then please send positive thoughts. According to Wikipedia, “It involves a setting where steam power is still widely used- usually Victorian era Britain- that incorporates elements of either science fiction or fantasy.” Many times you’ll see the use of futuristic machines made of brass and copper, dials and gauges and cogs that make the impossible seem likely or at least somewhat possible. Recently Rent What? 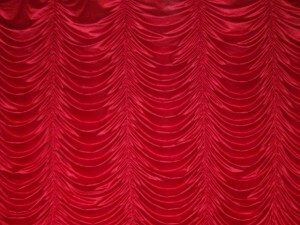 was able to add a gorgeous, shiny, beautifully created drape to its Rockin’ Red and Timeless and Traditional Series. 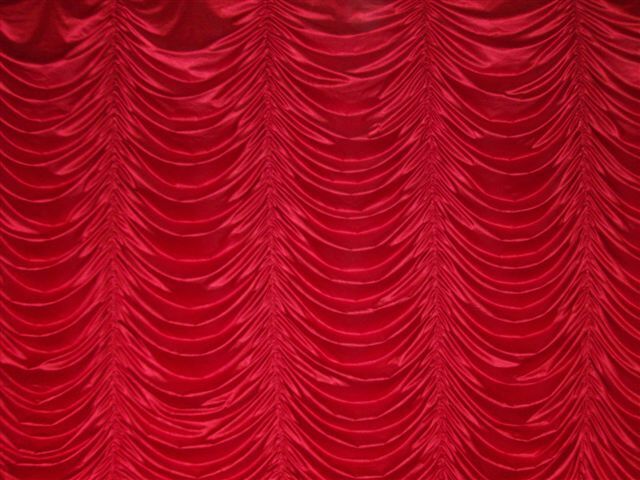 It is an unbelievable 30′ high by 60′ wide Red Satin Austrian Drape, with close to 50% horizontal and 25% vertical fullness in its beautifully sculpted folds. Our client needed something spectacular for a special edition of an internationally famous play here at the Nokia Theatre in Los Angeles. Utilizing our fabulous and easy to assemble rental Drapery Lift System (more on the different types of drapery automation to come in a future blog), this refined yet exotic Austrian Drape was able to be lifted and dropped with complete control from our client. With the help of our sister company Sew What? and the brilliance of their representative Gwen Winter, we were able to have them make this luscious drape merely from an simple idea in our client’s vision, and actually create it completely from scratch. With the incredibly hard work of an amazing sewing staff, she was instrumental in helping organize its development and creation in just two days– unheard of in the drapery design industry. A drape of this size takes more than 240 yards of material to construct, which is more than 720 feet, or 8640 inches, or 22,000 centimeters of material! And each panel is painstakingly sewn one at a time, with the lift line sewn right through the back of the seams. The seamstress has to gather all of this material on the vertical seams in order to create the iconic “smiles”, or soft swags, that an Austrian drape is known for. The greater the horizonal fullness, the longer and deeper these swags will become. Because it’s being lifted and lowered by a lift mechanism and not human hands, the lift lines have to be stragetically and evenly placed exactly right. The drape’s extremely elaborate construction takes a HUGE amount of man hours to sew and create, so that when the lift mechanism is activated, this beautiful drape will ride up and down smoothly and flawlessly so the audience will be completely blown away. 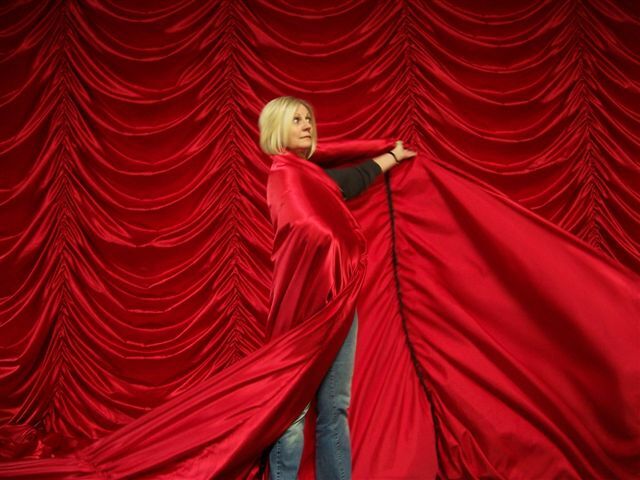 You can see now why it is so impressive that our sewing masters were able to cut, sew, and design this gorgeous 30×60 foot Red Satin Austrian drape in just two days! Now that we have added this amazingly versatile and gorgeous drape to our Rent What? collection, we know it will be a huge hit for all sorts of events– from holiday parties, rock concerts, stage productions, television shows, and everything in between. We can’t wait to see what else our clients will come up with next for us to help design for them!